Review: 2013-03-22, pretty good fight with a great third round but it is not enough to get three stars. Donovan George (24-3-1, KOs 21) entered as the No.21 super middleweight in the world while David Alonso Lopez (41-13-0, KOs 23) entered as the No.27 middleweight. 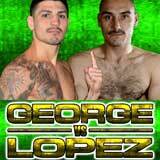 Don George vs Lopez is the main event of the night. Watch the video!